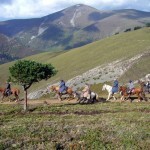 Primitive Way is the origin of the Camino de Santiago. In this section we propose you to do 180km from this beautiful road. This way start from the outskirts of Oviedo and join the French Way in Lugo. The first path starts in the early ninth century when Alfonso II march from Oviedo, then court of the kingdom, to the “Campus Stellae” to visit the newly discovered tomb of the apostle. Many pilgrims have been directed by this route to reach Santiago. Primitive Way is also done by pilgrims who came for the “French” and headed from Leon to visit Oviedo Cathedral “El Salvador”. This is the oldest Way and from there comes the name. King Alfonso II, aware of the discovery of the remains of St. James in a field located in the vicinity of Iria Flavia, pilgrim from Oviéu to the Holy Place and orders to build over the grave a simple church. So the first Jacobean route was the one that was created when the Asturian undertook the pilgrimage to the remote location of Gaellecia. That peregrination passed thought the cities of Oviedo, Grado, Fonsagrada, Lugo and Santiago de Compostela and now it is now known as the “Primitive Way”. This Way is currently maintaining a medieval flavor and a wild and stunning landscape that transports you to another age. 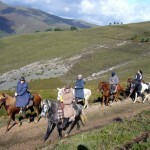 In its high peaks can be seen even Asturcones horses, which is the typical horse breed from Asturias which retain their wild character. In addition to these beautiful animals you can also see birds of prey such as eagles, vultures, etc. During the realization of this way it is mandatory to visit “Hospitales” which is ancient peregrine hospital situated in an inhospitable peak, now a days this hospital is no longer in use. From “Puerto do Acebo” we entered in Galicia and from this point the travel is becoming gradually softer. In this part of the path we will pass through meadows, pine forest trails till reach Lugo. 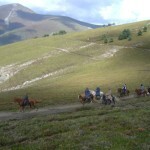 DAY 3 – Equestrian route CAMPIELLO – BERDUCEDO. 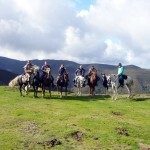 DAY 5 – Equestrian route CASTRO – FONSAGRADA. 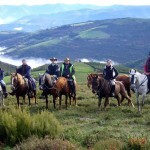 DAY 6 – Equestrian route FONSAGRADA – CATROVERDE.